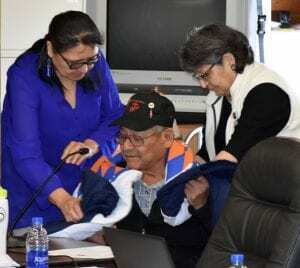 Purple Heart recipients Delmer Clown and Leroy LaPlante were honored by the Cheyenne River Sioux Tribe during the tribal council session on Thursday, April 4 at Oglala Lakota College in Eagle Butte. 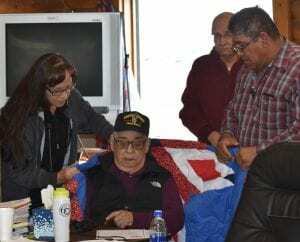 Clown, a Korean War veteran, and LaPlante, a Vietnam War veteran, who were both wounded in action, were each presented with a star quilt from the tribe in recognition of their military service and sacrifices during war. An honor song was performed for each veteran and families of the two gave speeches thanking the tribe and council for recognizing their loved ones. According to Veteran Service Officer Robert Dunsmore, the tribe plans recognize two Purple Heart recipients each month when Tribal Council is in session.